1.Heat about 2 tablespoons oil in a deep frying pan and fry the onion and garlic for 2 minutes over high heat. 2.Add the chicken, turmeric, chili powder and salt. Fry gently for 5-10 minutes or until golden brown scraping the base of the pan frequently and turning the chicken. 3.Add the tomato, cover and cook over medium heat for 20 minutes. Uncover and simmer for 10 minutes to let all the excess liquid evaporate and the sauce thicken. 4.Add the ghee or oil, cumin, ground corriander, ginger and fresh corriander leaves and simmer for 5-7 minutes or until the fat separates out from the thick sauce. 5.Sever the chicken pieces with the sauce spooned on top. 6.This dish could be served with Pulaoo rice, chapattis or naan bread. Akbar and Parveen have been FMIN Partners since August 2005. 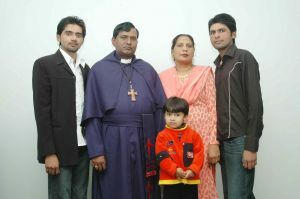 They pastor The Wesleyan Methodist Church in their predominately Muslim country of Pakistan. With six churches and eleven cell groups, their goal is to have a loving, caring association of members who encourage one another in the steps of Christ.